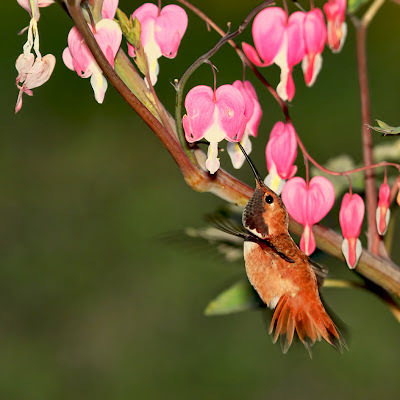 The rufous hummingbirds returned from Mexico back in late March and are constant visitors to the three feeders around our house although I notice that I haven't been seeing them quite as much now that lots of flowers are blooming. A little while ago I bought some bleeding hearts after learning that it's one of the flowers they enjoy. I set the plant close to their favourite feeder and was rewarded almost instantly when a hummingbird flew right for it. By the way, I took this picture and the next one with my new external flash. 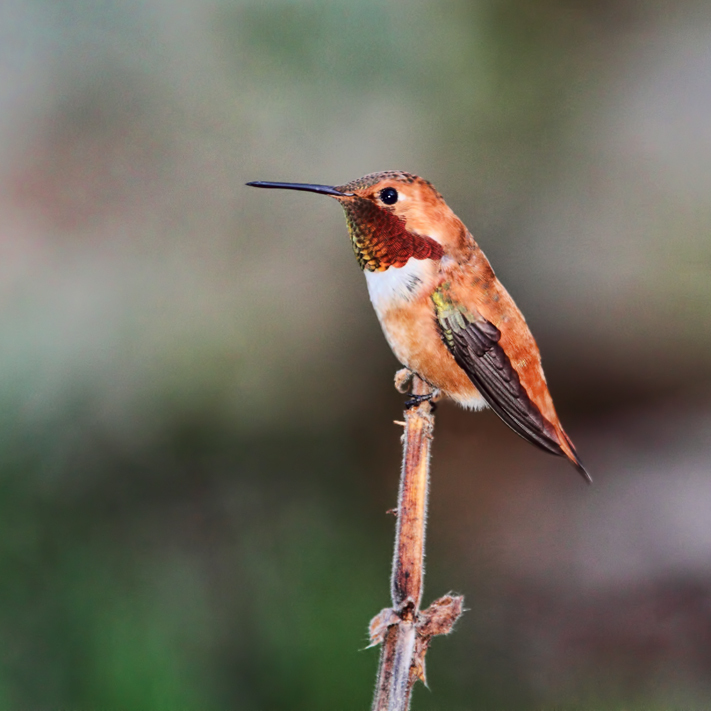 I photograph hummingbirds using natural light if it's bright enough and with a flash if it's a little dimmer, although you can use a flash anytime...they're good for filling in shadows in bright sunlight when shooting outdoors. One of the hummingbirds likes to sit atop a dried-out plant stalk and survey his domain and show off his beautiful gorget (neck feathers), not bothered that I'm standing very close by. 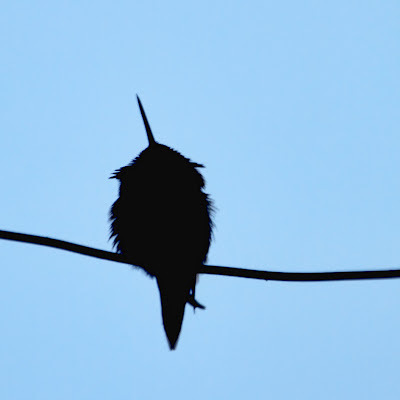 About a month ago I woke up at 5:30 a.m. and something caught my eye as I walked into the living room...it was a hummingbird sitting on the clothesline that runs along our back deck a few feet from the window. His beak was straight up in the air and I watched him, fascinated. I suspected that he was asleep. He stayed like this for about half an hour. I later researched this odd behaviour and discovered that hummingbirds sleep with their neck pulled in and their beaks straight up in the air. Sometimes they even fall asleep and hang upside down...I found a couple of amusing videos on YouTube with hummingbirds hanging upside down from feeders. I started to get a little worried about the sleeping hummingbird though because he began to twitch quite a lot. I half expected him to fall off the clothesline at any moment. A couple of chickadees came and went from the nearby bird feeder and the hummingbird still didn't awaken. However, finally a Steller's jay showed up and in the blink of an eye, the hummingbird zoomed off to some nearby bushes. I'm assuming he was o.k.! I love hummingbirds, and I love your site. Beautifully designed. Thank you so much, Marian! I'm sorry, but for some reason I didn't see your comment until today.